WS-Supporter is a potentially unwanted application that could turn out to be quite annoying and dangerous in some instances. In most cases WS-Supporter is a part of some software bundles. Due to its suspicious activity and a doubtful distribution methods WS-Supporter should be removed, if you wish to maintain a clean and secure system. It was noticed that in some cases WS-Supporter could be the reason your operating system might get exposed to some dubious web content. It goes without saying that running WS-Supporter on your PC might be quite dangerous. Remove WS-Supporter by using the removal guide provided below. Read the rest of the article and find out how WS-Supporter functions and why exactly are we advising you to remove it. A major indication that WS-Supporter is present on your operating system is a sudden change of your default home page and search engine. This activity resembles on of a browser hijacker. It is extremely annoying as you are not even warned about these changes. It was discovered that the home page provided WS-Supporter by could turn out to be malicious. In most cases the provided page is a website of some suspicious third-party search provider. That is quite dangerous due to the fact that in most cases third-party search providers often present dubious results. Sponsored results among such websites are extremely common, what is alarming about that is that virtually anyone could by a top spot on such third-party website. Thus, you could be exposed to websites crafted by malware distributors. Running WS-Supporter on your operating system is extremely dangerous as your system could get infected at virtually any time. If you wish to avoid all of this, please make sure to remove WS-Supporter as soon as it is discovered on your operating system. As mentioned WS-Supporter mostly come as a part of a software bundle. Thus, if you wish to avoid WS-Supporter or any similar suspicious application you should avoid websites that promote doubtful installers. We strongly advise you to download your software from official vendors’ websites only. It goes without saying, that you should pay your utmost attention while installing any kind of software onto your PC. Always chose advanced installation method because it will provide maximum information regarding the setup, you might even be presented with an opportunity to cancel any additional application. 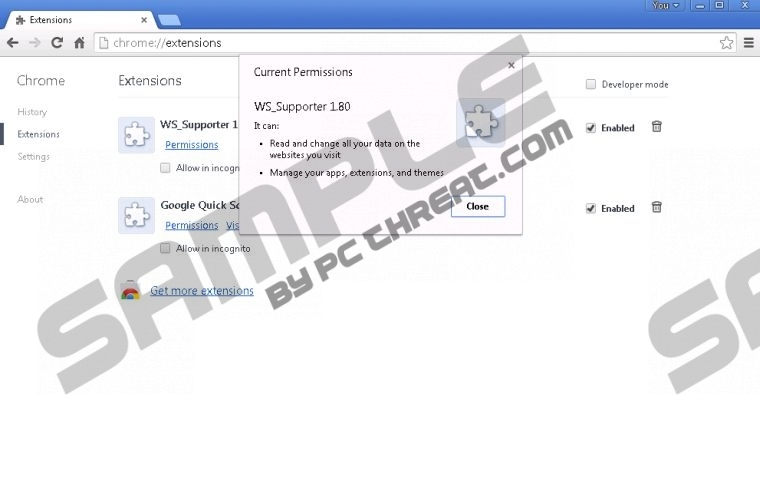 Do not hesitate and remove WS-Supporter once and for all as it is not useful in any way. Unfortunately, the removal process might be come to be complicated as it could involve registry tweaking. That is why we strongly advise you to scan your system with a professional malware detection and removal program in order to make sure that the unwanted application was removed. Select WS-Supporter and click Uninstall. Confirm that you want to remove WS-Supporter. Select WS-Supporter and click Remove. Quick & tested solution for WS-Supporter removal.